Heat oven to 375°F. Place squash halves on a lightly oiled baking sheet and bake for 45 minutes or until squash is soft when pricked with a knife. Let cool. Scoop out seeds and pulp and discard. Scoop out flesh and reserve in a bowl. In a large soup pot melt the butter. Add onion and celery and cook until softened, about 8 minutes. Add squash, stock, ginger, and honey and bring to a simmer. Cook for about 30 minutes. Using a hand-held immersion blender, blend soup until smooth. Blend in cream and salt and pepper to taste. Serve with goat cheese croutons. Heat oven to 375°F. Cut the logs into slices approximately 1/4-inch thick. Brush with the egg white and sprinkle with salt. Place goat cheese coins on a rimmed cookie sheet and bake about 15 minutes or until lightly browned. 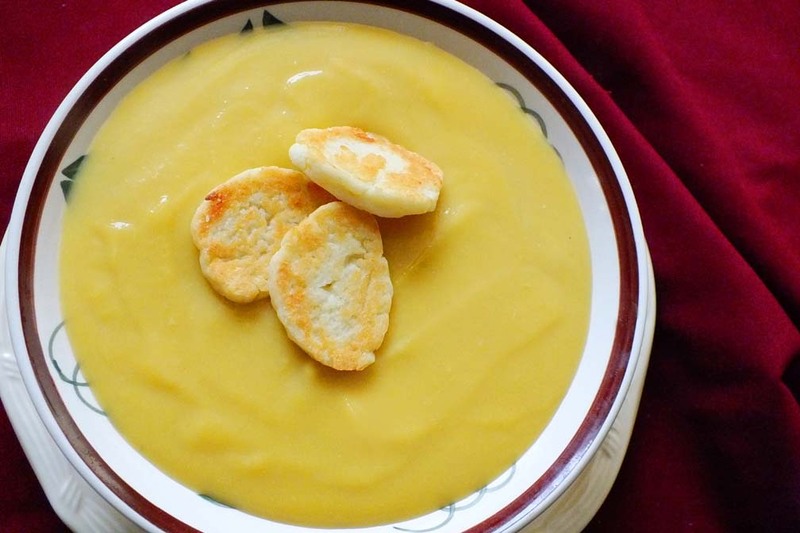 Remove from oven, cool, and serve atop butternut squash soup.